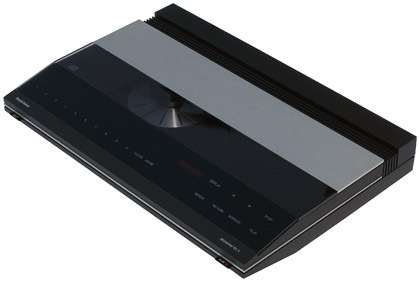 A compact disc player designed to work with any Beomaster or Beocenter with a Tape socket, or a turntable connection designed for use with a Beogram with a built in RIAA preamp. Despite the sleek looks, the CD X is really a Philips CD104, a conventional looking boxy machine, and was built in the Philips factory in Belgium. Text copyright © Beocentral. Unauthorised reproduction prohibited. Despite being based on 14 bit architecture, the pre-eminence of Philips in the digital audio field at the time blessed the CD X with superior performance figures to the Japanese based Beogram CD 50, though it lacked the latter’s remote control and Datalink possibilities. The claims of universal compatibility with earlier systems are certainly true, it even works perfectly with the Beomaster 900! For those users with no spare sockets left, the CD/Tape adaptor (see accessories section) allows one to “break in” to the tape recorder lead and connect the CD player. This unit fits under the side of the CD X, and has a little push button to select between the two sources. Text copyright © Beocentral. Unauthorised reproduction prohibited.